Bromo Tengger Semeru National park covers an area of 800 square kilometres in East Java. For everyone who love volcano atmosphere, you have to visit this place. The national park is the largest volcano region in East Java. When you visit this national park you can see the big smoke came out of mouth of Mount Semeru, the active volcano which in a height 3.676 metre above sea level and this is incredible scenery. The caldera in this park is the widest caldera in Java island, with its 10 km barren desert-like sea of sand. In this sea of sand found sever eruptive centers in two lines which intersect such as from east-west and northeast-southwest and from these lanes arise Mount Bromo which still active and sometimes it will throw volcanic smoke and threaten the society's life around it. The temperature on the summit of Mount Bromo is ranged between 5 until 18 celcius degrees. By the beauty scenery, easy access and adequate facilities, there's no doubt that this place is one of popular tourism destination in Java. Enjoy the spectacular scenery of sunrise on the top of volcano by traveling in the morning to Mount Bromo. In Penanjakan, you will get perfect image of Mount Bromo scenery, Mount Batok and spectacular scenery of Mount Semeru. Cross the desert and ride a horse, climb the steep stairs to get the summit of Mount Bromo, then you will witness the sun rises from the behind of horizon. Climb Mount Semeru, the highest summit in Java. This mount, also known as Mount Agung, considered by Hindus as the holiest mount of all the mountain. To reach the summit, it needs heavy trip for three days. Mount Semeru is one of the most active volcano in Java. Lots of gasses and bursts make Mount Semeru become danger, so watch out on your position. You can see the local culture in the fourteenth day of Kasada month, usually in November where indigenous people of tengger come together at the edge of the active crater to offfer respectfully some offerings such as rices, fruits, vegetables, flowers, chickens, and other crops to the mountain spirits. The belief of indigenous people of tengger integrate the elements between Hindu and Budha Mahayana. In Kasada ceremony, the society of tengger pray for blessing from God, Sang Hyang Widhi Wasa. This national park can be reached by using personal and public vehicle from Surabaya or Malang, East Java. The plane of Sriwijaya air fly twice a day to Malang from Jakarta. There are many ways to enter this park. The visitor from Probolinggo, in the southwest can be through Ngadisari village or from northeast through Pasuruan and Tosari village, the difficult is from Ngadas lane. The best way is through bottom route. Trip from Probolinggo is the easiest route and so far, this route is the popular route, especially if you go by public bus. Trip through Wonokitri is the closest and easiest route if you use personal vehicle from Surabaya (about 5 hours). To reach Mount Bromo, you must rent 4x4 vehicle (there are many 4x4 vehicles available for rent). Mostly tourists from Surabaya stay in Tretes, where there are some hotels, located in malang, a city which has airport. Or you can contact a travel agent to set your trip. There are many inns and hotels which is located around Mount Bromo. The Bromo Guest House located in Ngadisari, it's about 3 km from the crater rim. Or you can stay in Cemoro Lawang where there are some inns which located near crater. Some inns also available in Tretes and Prigen, Pasuruan, you can stay overnight in here before climb to Mount Bromo before the sunrise. 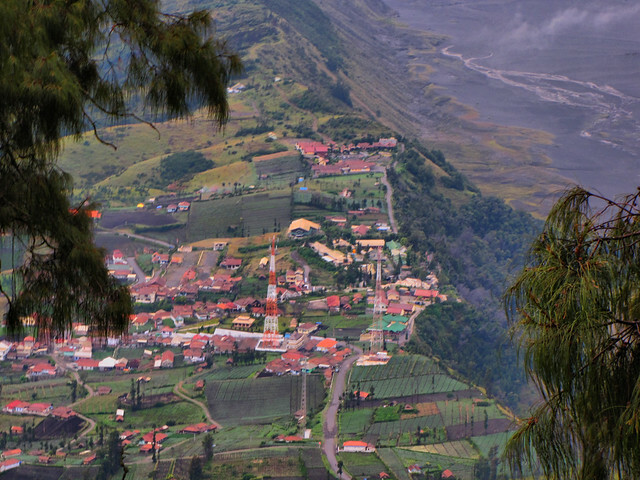 Malang is the hilly city which is fun to be explored during your trip to Mount Bromo. Some goods you need for this trip is torch, sweater, comfortable shoes and gloves as protector of cold air temperature between 0 degrees until 5 degrees. If you want buy or rent something, remember to offer it before. The sun rises between 05.00 AM and 06.00 AM (if sunny weather), so you must leave your hotel start from 03.00 AM. The best time to see the sunrise is in the summer on April until October and before you start to climb, make sure you have eaten, or bring some foods and drinks in your bag.